3rd-strike.com | Slam Land – Release date announced! 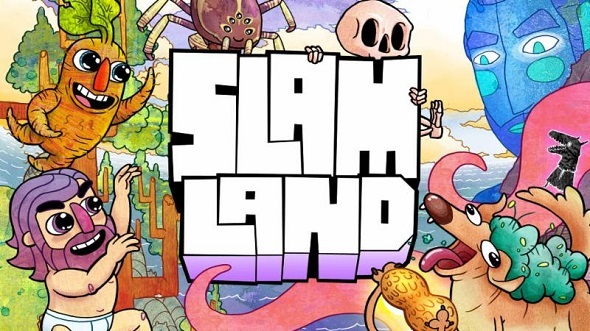 Slam Land – Release date announced! Slam Land will be released for Nintendo Switch, PlayStation 4, Windows PC, and Mac on August 7, 2018. This game has been developed and published by Bread Machine Games. This 4-player couch competitive fighting/party game is a fast-paced, chaotic experience where a bizarre blue giant enlists a cast of comical competitors to dunk one another into hoops for his amusement. So, gather some friends and bounce, dodge and lunge around, trying to capture and shoot your adversaries into a variety of bizarre goals ranging from tree hollows to gaping maws! To keep things interesting, Slam Land features several bizarre game modes additional to the classic slam matches, like a mode where you’ll need to spell out a word by shooting lettered NPCs, and a mode where you’ll get a higher score of you hold on to a peanut. For more information, visit the official website of Slam Land!